Plant-based eating continues to be a popular trend in the health and wellness space, and for good reason. Not only is plant-based eating better for the environment, but it is better for your overall health as well. Studies show that consuming more whole, plant-based foods on a daily basis can help to reduce the risk of several chronic illnesses including coronary artery disease. I always tell my clients that the best way to enjoy more plant-based dishes is to swap some of the ingredients in your favorite dishes for plant-based ingredients, for a fresh, nutritious twist. 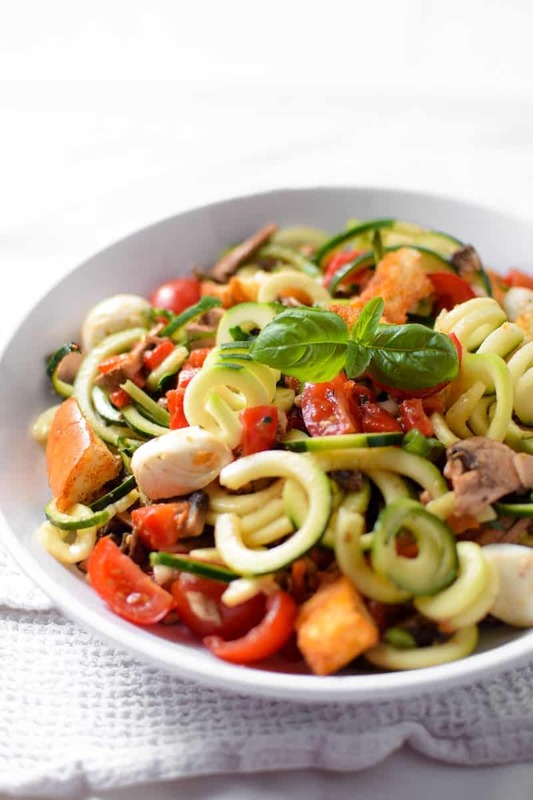 This summer at your family BBQ try this Fresh Zucchini Panzanella Salad instead of your traditional anti-pasta salad made with white pasta and processed meat. This delicious twist that will help you to enjoy a mouth-watering plant-based salad swap with an extra serving of veggies. In some cases, surgery may be needed. But there are other options too; including percutaneous coronary intervention (PCI), a minimally invasive procedure that is used to manage CAD. One message I am passionate about is that everyone – regardless of their health – should enjoy their food and lifestyle while being mindful of their wellness. By making heart-healthy ingredient swaps, you can make a popular dish better for your heart. Using plant proteins rather than meat – think tofu, tempeh or beans. Replace cow’s milk with soy, almond, rice or oat milk. Use whole grains rather than refined grains. Instead of reaching for the salt, load up on fresh herbs and spices to give your meals a little extra kick of flavor. When in need of sweetener, use a natural sugar substitute such as maple syrup, honey or stevia. Use avocado as a healthy fat. Of course, it is important to remember that some heart-healthy swaps and recipes may not be right for everyone. Talk to your doctor or other qualified health care provider before making any changes to your diet. You should follow your doctor or dietitian’s guidelines for dietary restrictions for heart disease. 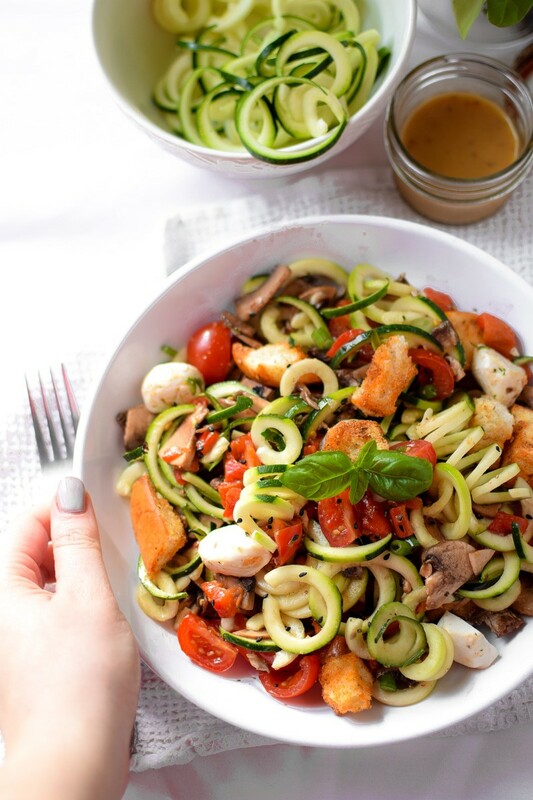 Enjoy the fresh taste of summer with this Fresh Zucchini Panzanella Salad made with zucchini, mushrooms, vine ripened tomatoes, and homemade croutons. ¼ loaf of day old French bread, drizzled with olive oil, minced garlic and parsley. Bake for about 10 minutes at 350 F. Cool and slice into croutons. Use gluten-free bread for a gluten-free option. Use a small jar with a cover or small container with a lid to shake the dressing for thorough mixing. 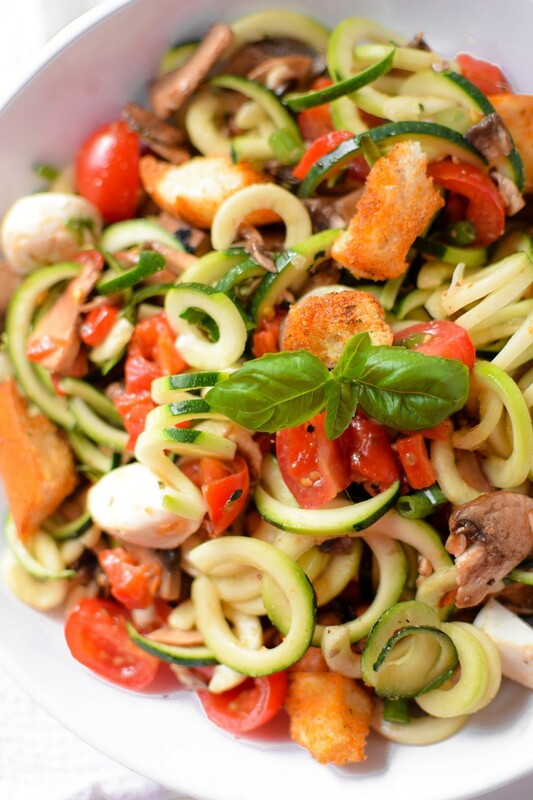 Use a spiralizer to make the zucchini noodles (zoodles), rough chop and place in a fine mesh strainer. Lightly salt with a few grinds of the salt shaker and toss to coat. Allow zoodles to drain for 20 minutes or so. This will reduce the water content of the zucchini. In a small bowl add the roasted red pepper, tomatoes, mushrooms, scallions and mozzarella (if using). After zucchini is drained combine and toss all ingredients together and chill in the fridge while you make the croutons and dressing. Assemble the dressing in a covered container and shake well to mix. Adjust flavor to taste if desired. 5 minutes before serving add the croutons to the salad mix and add the dressing over the top of all. Lightly toss to coat and serve immediately. We liked this recipe so much that I made it two nights in a row. Enjoy! Note: This is best served fresh, so I made this in a small quantity. I don’t think it would this would refrigerate well. To make this recipe gluten-free, start with a gluten-free loaf of bread instead of French bread and follow the same process. Ensure all of your other ingredients are gluten-free as well including your soy sauce and other dressing ingredients. To make this recipe dairy-free, eliminate the mozzarella or opt for a plant-based cheese alternative. Thanks so much, Taylor! So happy to hear you love these heart healthy swaps! Thank you so much! I agree– I love using fresh ingredients straight from the garden to make plant-based dishes! Thank you! Glad you like this heart healthy spin on traditional panzanella salad! Thank you! And yes, most grocery stores do sell duck sauce. Check the international foods or condiments aisle at your local grocer! That dressing sounds amazing! Do they sell duck sauce in most regular grocers? I’ve never looked for it. I remember the first time I learned what a panzanella Salad was. Best day ever. And now this is all the more reason to love it!!! What a vibrant dish! I am so excited for fresh tomatoes and love the emphasis here on more plants for a healthier heart, amen! Such beautiful photos! This looks so fresh and delicious! I’ve been wanting to try panzanella salad and love the Asian dressing you used here. Sounds delicious for summer! Love these heart healthy ingredient swaps! 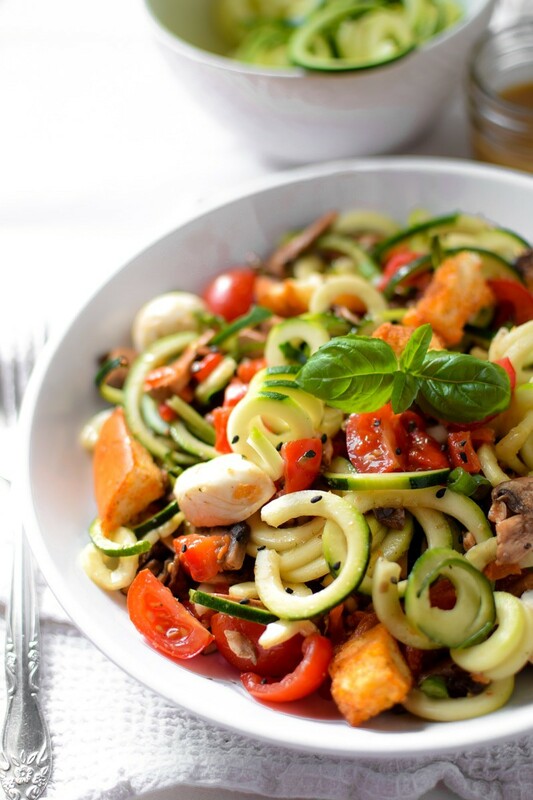 This zucchini panzanella salad looks so delicious! Definitely would love this for dinner!